Cruising around the web and came across a really fun challenge called 12 Tags of Christmas with a Feminine Twist at Ellen Hutson's....OK so I am late to this party, but isn't that fashionable? Better late than never? 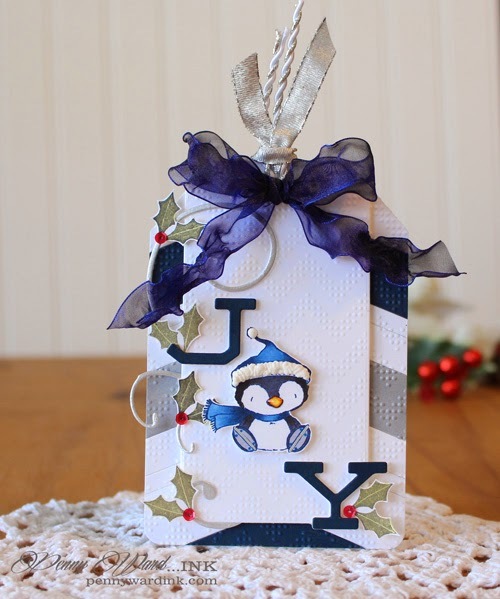 The challenge is to make a tag inspired by one on the Ellen Hutson Blog. What you can't see in this picture is that she made the Aqua and White background from strips of scallops adhered in rows. She added a really cute wintery animal with a scarf. My background is rows of die cut Chevrons and a cute wintery animal with a scarf. Look at that wonderful shine on the Holly (painted on with Pear Tart Fireworks) and his hat has Marvy Liquid Applique for dimension. This is darling, Penny! It sure would dress up a package under the tree! What a cute tag Penny. I love the penguin! Well, I was thinking of entering, but since this is the winner, there is not much point!! Love it!!!!!! Cute! 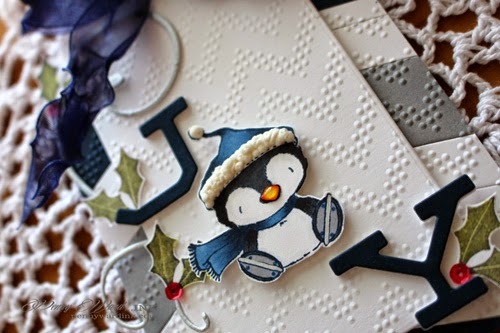 The penguin is perfect! Thia is one of my two favorite cards in the entire series! 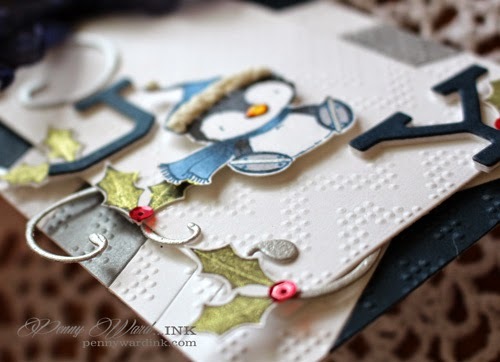 I just love the way you used the penguin and the background adds so much depth to the card.